Baltimore, MD (February 20, 2013) – Otakorp, Inc is proud to announce a brand new event by fans, for fans – Otakon Vegas! 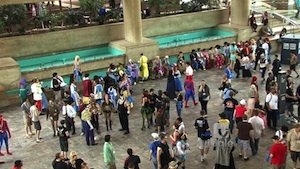 Otakon Vegas will be held at the Planet Hollywood Resort and Casino in Las Vegas, Nevada from January 3-­5. Baltimore, MD (January 31, 2013) ­ Otakon’s “Year of Awesome” continues with the announcement that hip hop group Home Made Kazoku will return for Otakon 2013, joining previously announced T.M.R. in a spectacular joint concert event on Saturday. Baltimore, MD (January 30, 2012) – Otakon is pleased to highlight the “Year of Awesome” by welcoming back musician T.M.Revolution for a special Saturday concert at Otakon 2013. He returns ten years after debuting to American audiences in 2003. Baltimore, MD (January 23, 2012) – Otakon is pleased to announce that the multi-talented Crispin Freeman will appear at Otakon 2013. 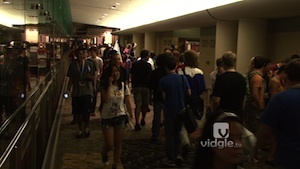 The popular and prolific voice actor last appeared at Otakon in 2009. Baltimore, MD (January 17, 2013) – Otakon welcomes back to our 20th celebration award-winning producer Masao Maruyama, a longtime friend of the convention. This will be Maruyama’s eleventh appearance at Otakon, making him our most frequent guest. Maruyama is also the first guest to be named an honorary staff member. Baltimore, MD (January 9, 2013) – First appearing at Otakon 2005 and most recently at Otakon 2010, we are pleased to announced that Vic Mignogna will be joining us and other returning friends for our 20 th celebration at Otakon 2013.